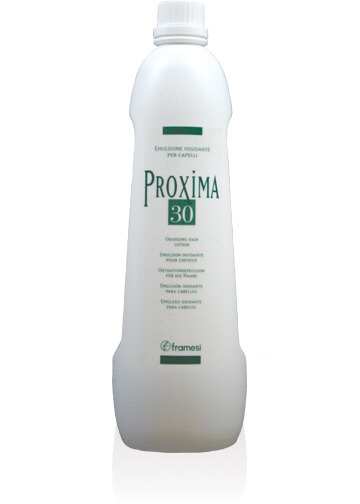 Proxima Developer is a creamy liquid developer rich in vegetable coconut oil and castor oil. For toning pre-bleached hair or refreshing faded ends. Proxima Developer is a liquid cream developer rich in vegetable coconut oil and castor oil for maximum protection of the hair and scalp. Provides a workable rich consistency and condition of a cream with the mixing ease of a liquid. Leaves hair receptive to additional chemical services. Aqua (Water/Eau), Hydrogen Peroxide, Cetearyl Alcohol, Lauryl Alcohol, Etidronic Acid, Ceteaeth-20, Disodium Phosphate, C12-15 Pareth-3, Myristyl Alcohol, PEG-40 Castor Oil, C12-15 Pareth-3 Phosphate, Cyclopentasiloxane, Methylparaben, VP/VA Copolymer, Laureth-7, Simethicone.